Disney World dining either delights or disappoints based on what city you call home. 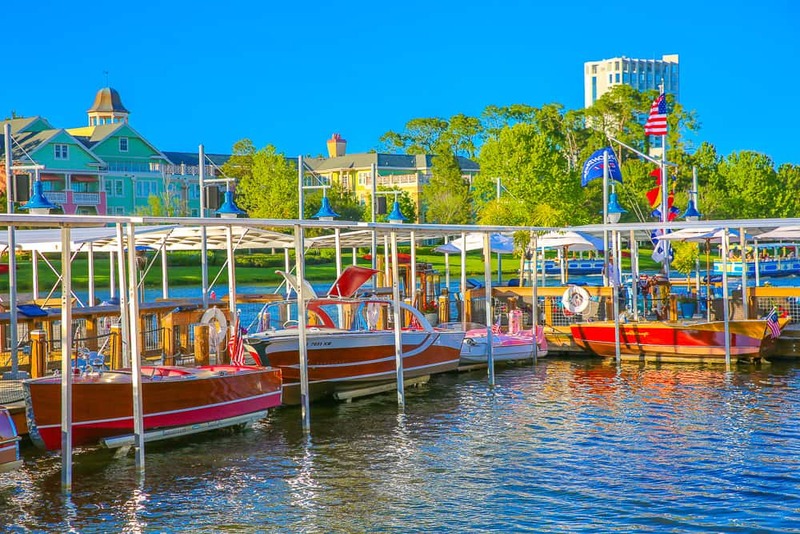 If you live in a major metropolitan area with access to great restaurants like Chicago, New York, San Francisco, or Washington DC, it’s hard to get excited about dining at Disney World, particularly when the city of Orlando has such a bursting restaurant scene for those willing to leave the Lake Buena Vista area. But I appreciate that if you don’t live in one of America’s foodie cities, Disney World can be an exciting dining destination, and it is really trying to push to the next level with an ambitious list of new openings in recent years. 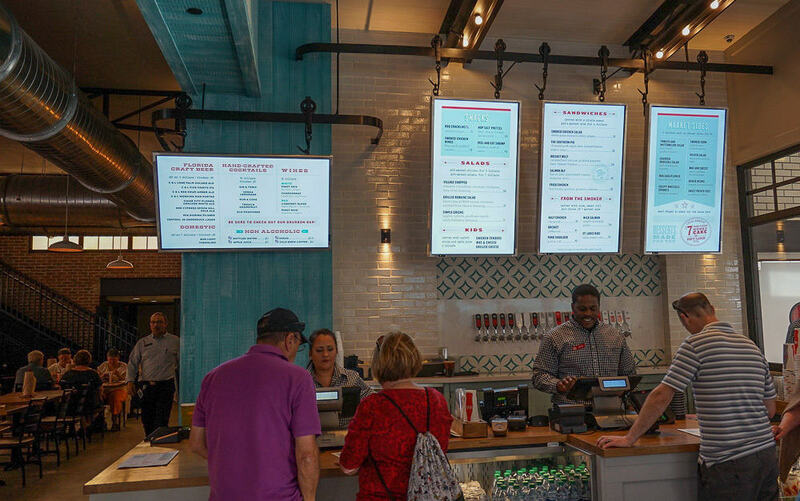 Disney Springs in where nearly all of the food buzz is happening, with each new group of restaurants outperforming the last. Here are our favorites. I’ll never dispute the experiences Disney World offers for families, and I love how easy it is to take children to nearly all Disney World restaurants, but my family and I are always looking for that meal where we feel the inflated Disney World prices still offer objective quality worth its Disney cost. Thigh High Chicken Biscuits at Art Smith’s. 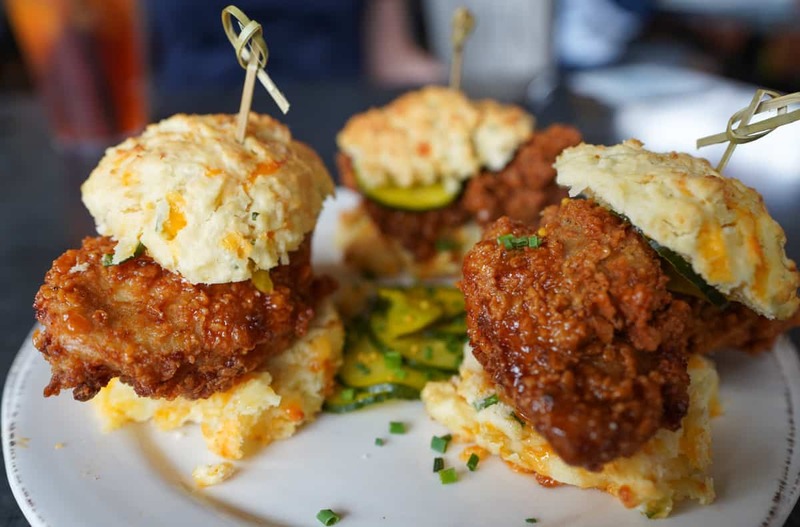 Chef Art Smith’s Homecomin’ is all about caloric Southern comfort food. I waited to visit the restaurant when I wasn’t traveling with my gluten-free husband, because it strikes me as a pretty painful place to be gluten free. We started our meal with the Thigh High Chicken Biscuits, fried chicken dripping with warm honey and pickles. It was an incredibly rich appetizer. To try and recover from a fried chicken biscuit sandwich, I ordered the Florida grouper served with an unbelievable carrot soufflé. I know the added sugar is what made it taste like dessert, but it was worth every bite. The braised greens were just drenched in so much salt that I didn’t eat them because it felt unkind to my body to ingest a month’s worth of sodium. As luck would have it the kitchen offered me the grilled corn succotash as a replacement, and I found those two side dishes my favorite part of the meal. Vegetarians can still eat very well here. We had the fried chicken entrée at our table which I tried, and it was very good, but felt redundant after our appetizer. The restaurant is known for deviled eggs and a Jasper Board of southern inspired charcuterie I’ll look forward to trying next time. There’s a famous Hummingbird Cake that we planned on ordering, but we had no more room after our appetizer and entrées, so we had to leave without dessert. Art Smith’s Homecomin’ Hummingbird Cake, Auntie’s Chocolate Cake, and Moonshine cake. Art Smith’s was incredibly strong restaurant where everyone was impressed with all the dishes that they had. It’s ideal for groups who typically arrive with big, insatiable appetites, like a family of teenage boys. I never thought I would be excited to try a new restaurant while at Disney World, but I had hopes for Morimoto Asia Disney Springs to be a fun family night where the food might make us feel like we weren’t eating in Lake Buena Vista. Let me say this. 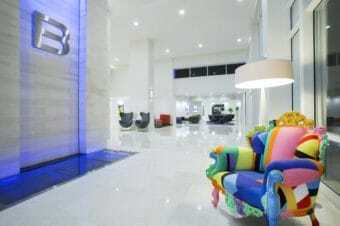 Go for drinks to see the spectacular design, which is definitely in a league of its own. The quieter sushi bar and lounge on the second floor is where to head on a night without children. The two-story dining room is anchored by dazzling chandeliers hovering over magenta orchids. A large white sculptured bar connects the different dining spaces in an Escher-like way that challenges our perception of three dimensions. We had a fantastic center booth where we could see the Peking duck hanging in the kitchen and enjoy Studio V’s restaurant design directly above us. As for food and service, we had a miserable experience. I think it is ideal to reserve judgment on a restaurant until you have had several dishes. I can only speak about our one meal and our server, and I would be willing to try it again, because it could only get better. “Pork buns.” Now, in hindsight, I still don’t know if he simply didn’t give a damn, or, if indeed, pork buns would have been the only safe thing to order. We asked for the gluten-free menu for my husband’s allergy, and we ordered the Lobster Chow Fun to share. I started with a calamari salad, and my husband enjoyed a house maki roll. The sushi was very good. My salad was a disaster. A beautifully seasoned mixture of greens, cucumber, and ginger perfectly balanced over a mass of tempura calamari that was as worthy as the worst Asian fast food at suburban American mall. I just can’t imagine the kitchen thinking the calamari I had was an example of tempura that they would have been proud to serve: doughy, tough, and flavorless. The dish would have been saved with grilled whole calamari instead. 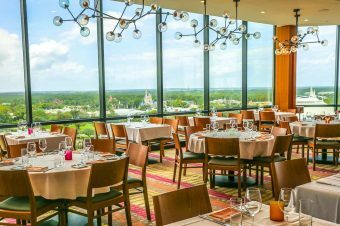 Read our list of the best places to eat at Disney World resorts and parks for Foodies. The supposedly gluten-free lobster chow fun arrived. First, I don’t think our server bothered to note our gluten-free request. The lobster was coated in something before being stir-fried, and there was so much heat in the dish from cayenne pepper, that every single flavor was masked. Our $50 entrée was not a hit. Luckily our family food allergies aren’t life-threatening. I had always praised Disney World for handling special dietary needs well, and this was a dramatic fail to us. The Morimoto children’s menu earns points for creativity, but I am curious how practical it is. The panko-fried hamburger patty served over brown rice or the hot dogs in steamed buns with cucumber may be better bar food bites. My kids were happy with edamame, miso soup, lo mein, and vegetables. We couldn’t linger for dessert. I enjoyed my last view of the spectacular room on the way out. Until the kitchen adjusts, a safer bet is sticking with the sushi menu and keeping low food expectations. The spectacular interior and a few cocktails will easily compensate. Anyone who has eaten in Chicago these last twenty years knows Rick Bayless and his contribution to high-end Mexican food. I’ll never forget my first meal at Topolobampo about twenty years ago. I thought I had died and gone to heaven. The various Frontera Grill outposts, including the Chicago airports are solid foodie favorites. I am so happy to report that the Disney Springs Frontera Cocina doesn’t disappoint. 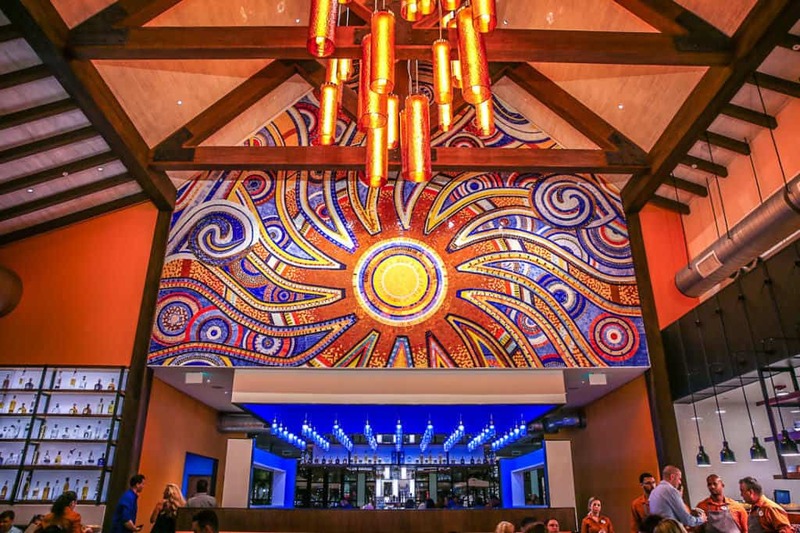 Rick Bayless’ new Disney Spring restaurant, Frontera Cocina, will not disappoint. The high ceilings, copper light installation, and festive design with backlit shelf after shelf of tequila is a fun night out. 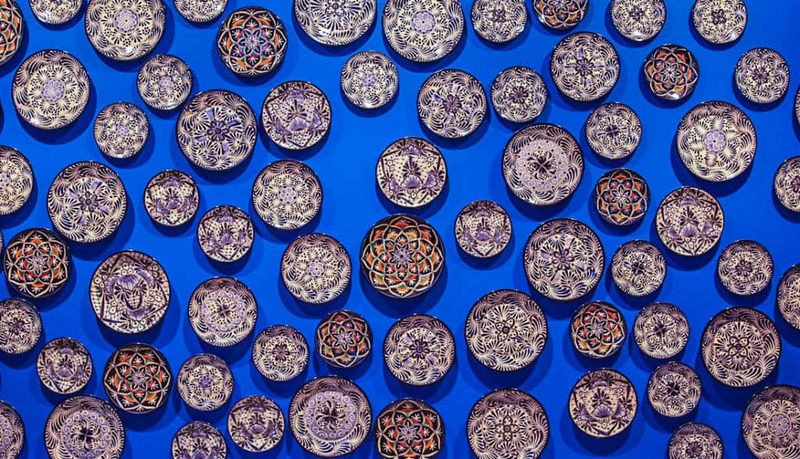 The menu contained many standbys that Rick Bayless’ kitchens create. The ceviche-style shrimp and scallops with salsa verde and avocado chunks were served with warm, salty chips. The trio of chicken tostadas was excellent as an entrée or an appetizer to share. All tequilas are top shelf at Frontera Cocina. I found that everything tasted delicious, and I loved the vibe in the restaurant that worked well for families, too. It is now my favorite place to eat in Disney Springs where I feel like it scores well on price, value, and quality. 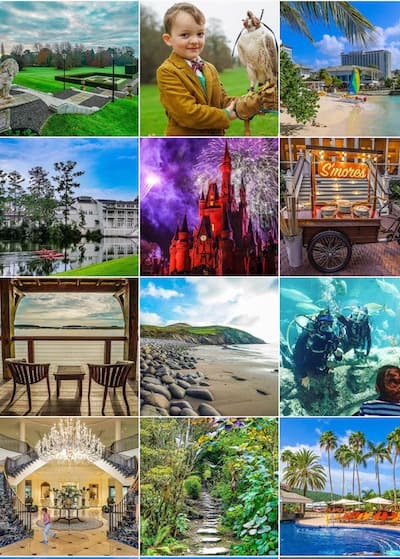 your questions when planning your next Disney vacation. I can’t really talk about the Boathouse as a restaurant with great excitement. It’s fine. There’s nothing incredibly creative about the menu. It’s that waterfront dining experience your in-laws love to take you to for an early Sunday dinner in any given beach town in Florida. The food is fine, but the boat offerings are why you should come. The Boathouse has a marina packed with an eclectic assortment of a boat collector’s dreams. They are fun to look at, but even better are the specialty rides the Boathouse offers. The one I am eager to try is the Venezia Champagne Cruise, inclusive of champagne and chocolate covered strawberries. It’s certainly not the Grand Canal, but who doesn’t love those beautiful Venetian water taxis. 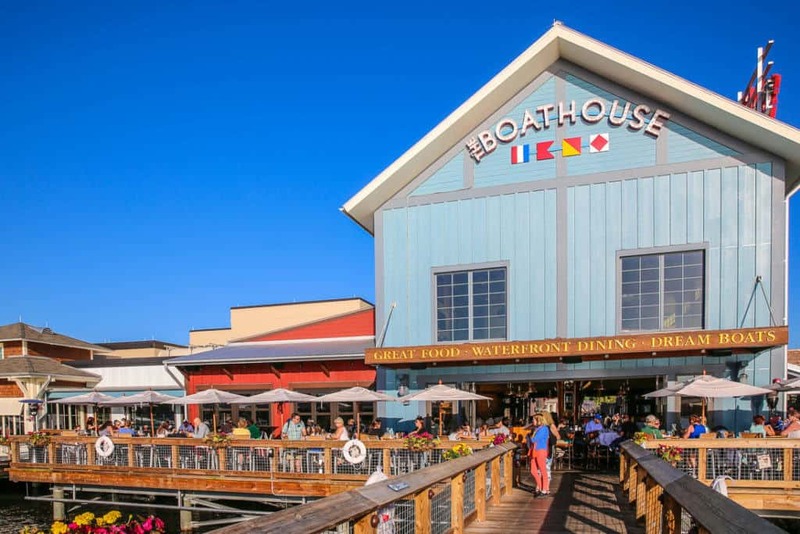 The Boathouse in Disney Springs displays an impressive array of collector boats to enjoy. The most family friendly option is the Amphicar collection for a memorable spin, driven by the Boathouse captains. Call ahead and ask for specific schedules in order to book your reservations when you make your dining reservations. 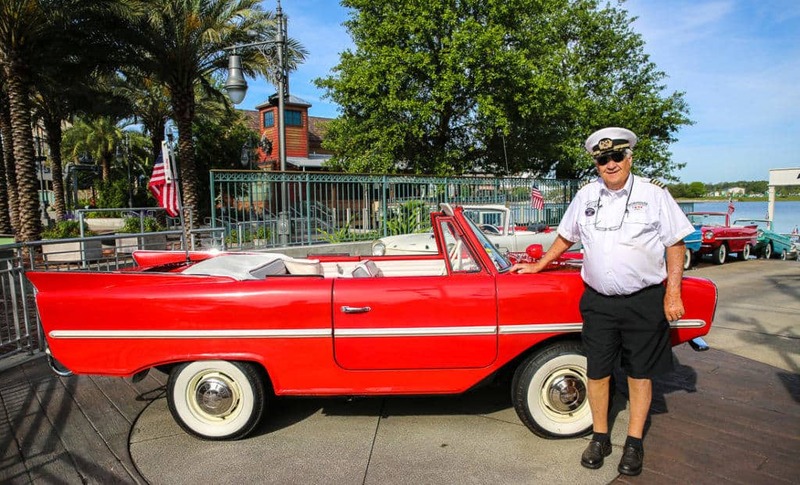 Families can take a boat ride at Disney Spring in an Amphicar, captained by someone who knows where he’s going, to remove all risk of mom and dad arguing in the middle of the Springs. Rush hour at Disney Springs. Views from the top level of Paddlefish. Paddlefish is the most promising new restaurant yet, to me. 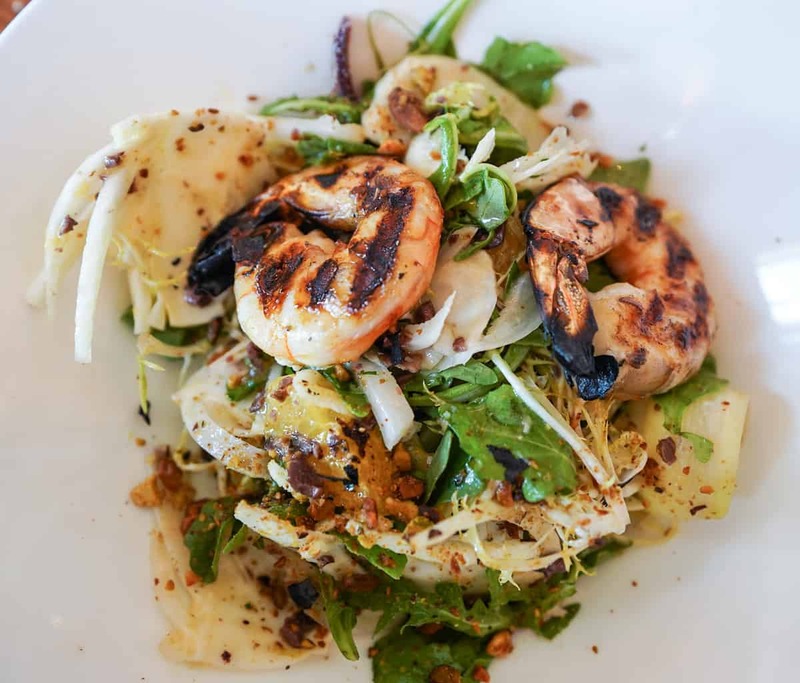 While the Boathouse has a somewhat staid kind of feel favored by 70 year olds who frequent steak houses, Paddlefish is sleek and modern, and even a little romantic and hip. 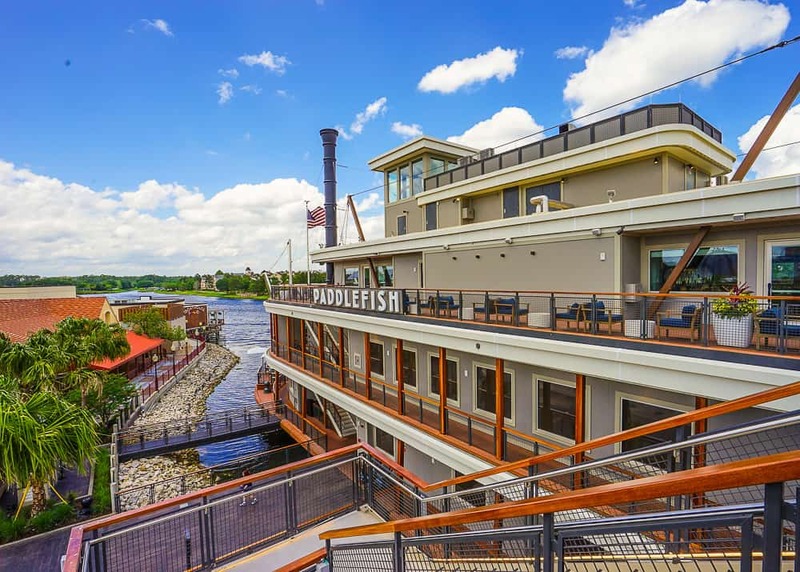 Paddlefish is one of the more promising newcomers at Disney Springs. The multi-level boat offers three levels of dining and lounging with water views. We enjoyed the Crab Louis french fries to start. I was happy not to order the tableside lobster guacamole for $36 when I saw how little lobster meat was used in it at a nearby table, however. I enjoyed an Ahi Poke, and my kids had delicious meals of well made burgers and green beans. The top of the boat offers lounging and cocktail areas with penthouse views of Disney Springs with a more sophisticated feel. It’s the first Disney Spring restaurant I would eagerly return. 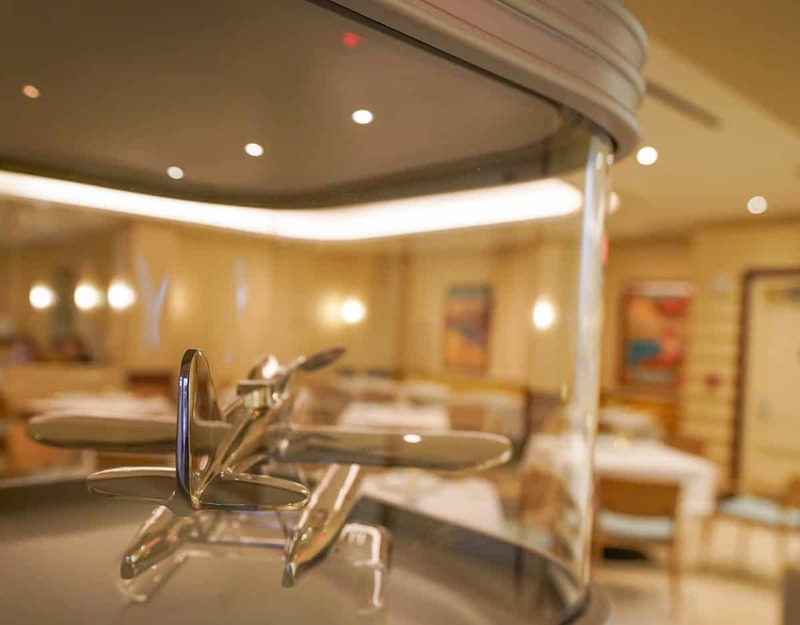 The design of Paddlefish is sleek and sophisticated. The Ahi Poke at Paddlefish. The Crab Louis french fries with lump crab meat and Thousand Island dressing at Paddlefish. STK Orlando is a very weird choice for Disney Springs, and probably will prove to be one of the least successful of the new restaurants, but what do I know. The interior space is dramatically black and purple with white accents. The black marbled bathrooms and black grasscloth wall paper is so dark, you will reach for what you assume is a sink and wash your hands as if your eyes are closed. 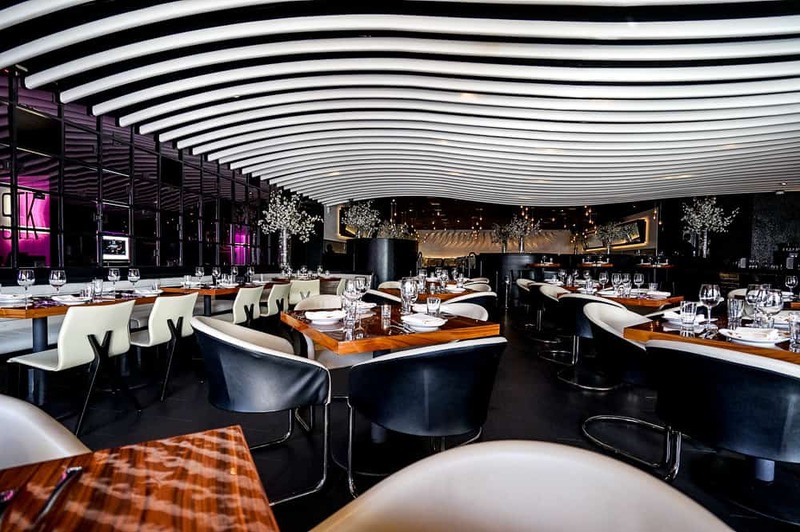 The interior design of STK Orlando is its strongest attribute. Although there are kids menus, this is one of the few places I felt apologetic about dining with my children, no matter how well behaved they were. The staff, though warm, are still under the impression they are working somewhere way cooler than Disney Springs. The menu was a modern steak house template, and my filet mignon with crab meat and Bernaise was adequate. My children ordered grilled chicken with broccolini but were served chicken coated in black pepper with asparagus. So they ate almost nothing. One more irksome thing that happened was that we were brought their bread and we were told it was gluten free, when it was just the regular bread served at every table. 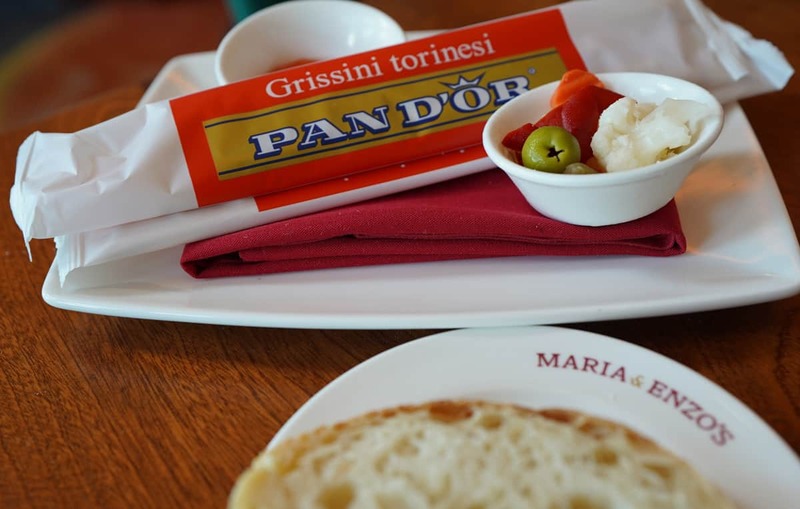 Since we have had similar indifference to our dietary requests at Marimota Asia, I caution you to ask to speak to the chef at Disney Springs restaurants, as they don’t seem as strict with food allergy policies at the park and resort restaurants. Go back in time and think of vintage films like Roman Holiday, Three Coins in the Fountain, or of Sophia Loren and Cary Grant. Picture a stylish retro vibe restaurant focusing on Hollywood’s Golden Age and its cultural intersection with Fellini’s Rome. OK, that’s not Maria & Enzo’s. This must’ve been the elevator speech that the Patina Group used when pitching Disney for the new restaurant that is part of a new building with The Edison and Enzo’s Hideaway. As we sat down the maître d’ approached us and asked with wonder and suspicion, “How did you hear about us? Were you just walking by?” That was the first sign something was amiss. It’s not good when the staff wonder why you’re there to dine. There’s a very strange gimmick about the restaurant’s theme, bringing in elements of an airport with departures, and gate numbers. 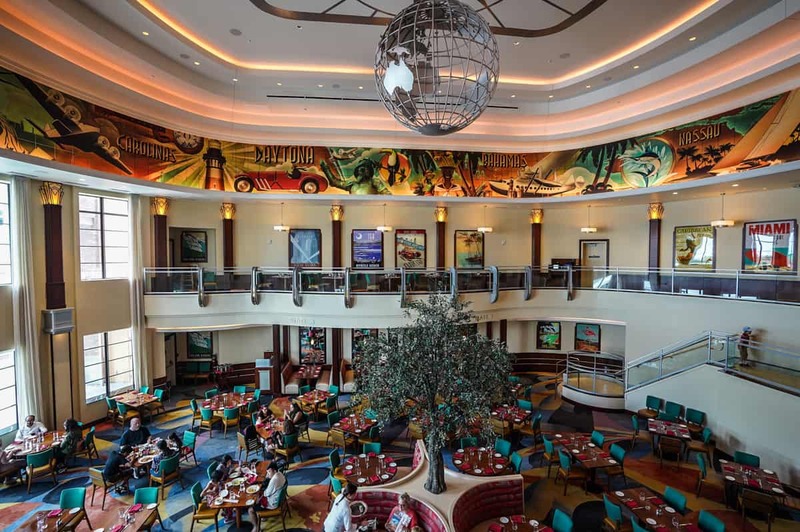 Brightly colored vintage travel posters adorn the walls of the circular dining room underneath a massive globe sculpture. There’s a First Class Lounge that seemed to for private dining. A nearly exclusively Italian wait staff offer a very challenging menu. It seems like this restaurant never knew what it was supposed to be, and there were too many cooks in this kitchen to blame such a schizophrenic result. It’s neither an Americanized red sauce Italian joint from the 1960s or an authentic menu of modern Italian cooking. The grapefruit jam to accompany breadsticks was them most creative flavor we tasted. What appears to be an effort towards authentic Italian food, one wonders why meatballs dominate the menu (which are an American invention). I ordered a salad that sounded excellent from the menu, and authentically Italian with citrus sections, fennel, arugula, pistachios, olives, and parsley. I added grilled shrimp, which was a big mistake. I bit into one of the grilled shrimp, and stop chewing because I realized many Italian chefs would leave the skin on the shrimp to grill them. I stopped to remove the outer shell of the shrimp to find there was no outer shell—the shrimp was just that tough and overcooked. My son enjoyed a meatball, pasta, and very well-prepared broccoli knee, but my husband’s pasta was nothing remarkable. The most interesting dish brought to the table was a jam prepared to accompany breadsticks that was richly flavored with grapefruit and had a subtle heat as if it had come from wasabi, but the server assured me it was a pepper. Unfortunately, the Italian staff brought an authentic Italian pace to our meal. I have no problem slowing down my American timetable if I’m in Bologna or Rome. But if I am in in Disney Springs, I’m not interested in lingering for a long lunch with tired kids. This restaurant is definitely one to skip. Ci vediamo, Maria e Enzo. 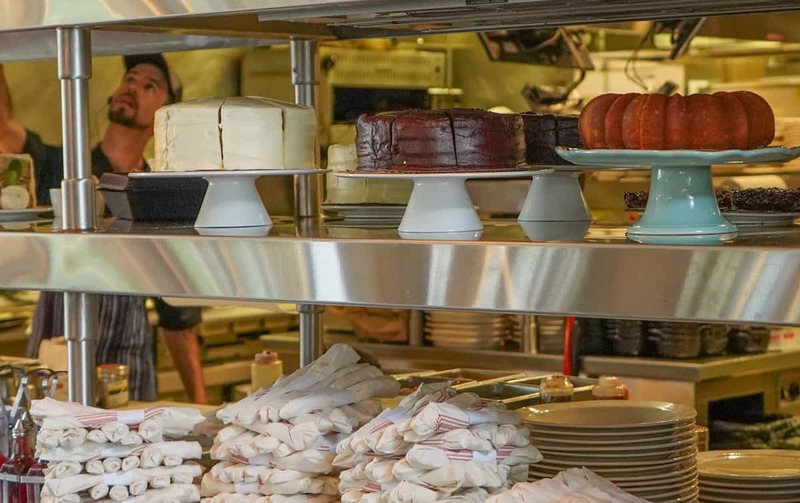 The Polite Pig showcases James Beard winning power couple Julie and James Petrakis. This place is hard to leave empty-handed. 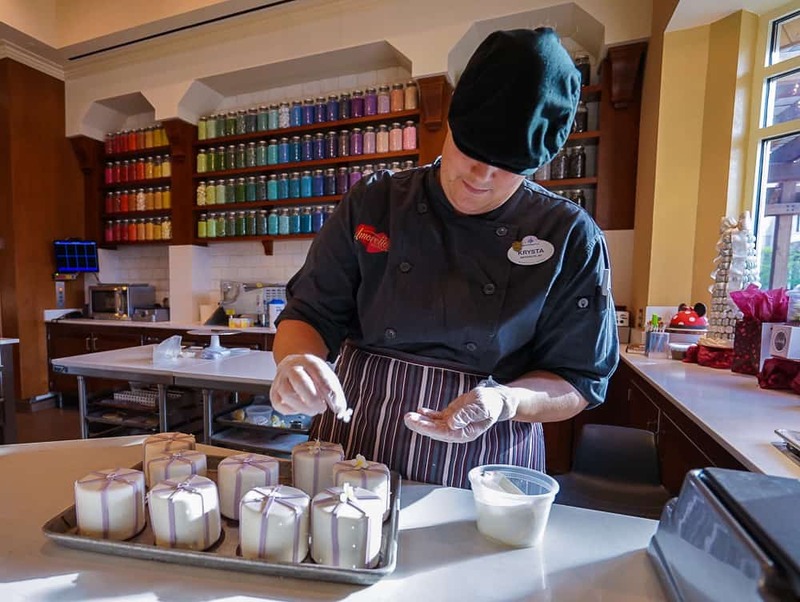 Fusing elaborate French pastry traditions and the whimsy of Disney is a no-brainer, home run. 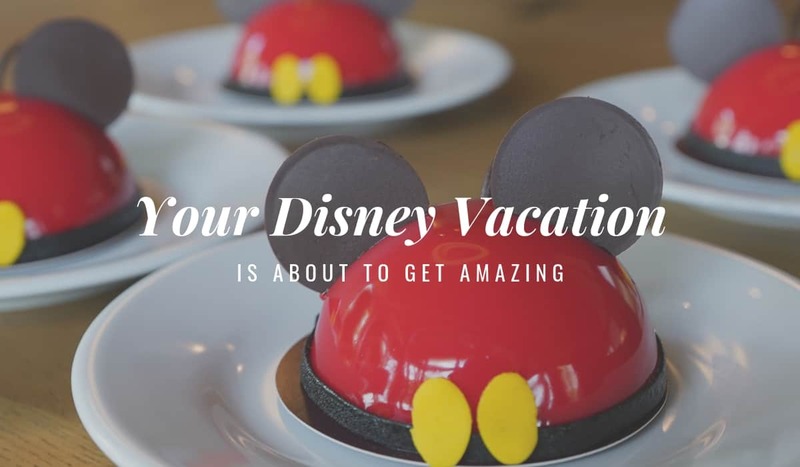 The house specialties all assume the shape of mouse-ear hats, the half dome cakes and mousse, like the Mickey Mouse dome mousse pictured here, covered in a shiny red gelatin. The signature Amorette’s cake contains several layers of cake in different flavors and is available in a small and standard size. Gluten-free options include macaroons and mousse. Sparkling wines and champagnes are available here, too, to make it a dessert destination after the other restaurants. For all chocoholics, the new Disney Springs sweet shop the Ganachery offers various chocolate treats in an old apothecary theme. The result is so antiquated that it would almost work as a store in Daigon Alley. My daughter purchased every test tube of pearl chocolate candy: milk, dark, white, and caramel, and strawberry. I had my eye on the Star Wars bars near the cash register for gifts, but the majority of the merchandise was small batch, high-end chocolate in the cases. Traditional favorites like raspberry and passion fruit are mixed with more adventurous combos like mango-curry and matcha-yuzu. 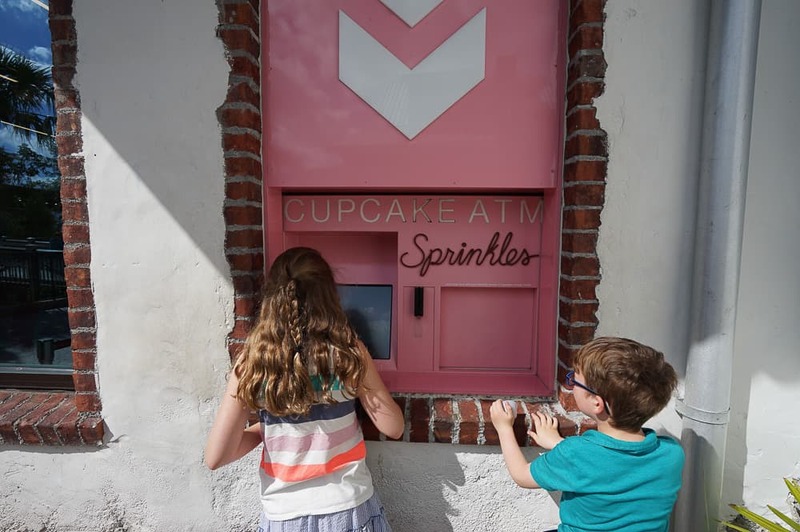 Sprinkles Cupcakes opened and offers their famous cupcake ATM. I found, on my second visit, really good cupcakes that were worth the splurge. Despite the novelty of the ATM, go inside and order where you have full access to their menu, including ice cream additions. For a true sugar rush, Goofy’s Candy Company offers both bakery items and bulk candy. 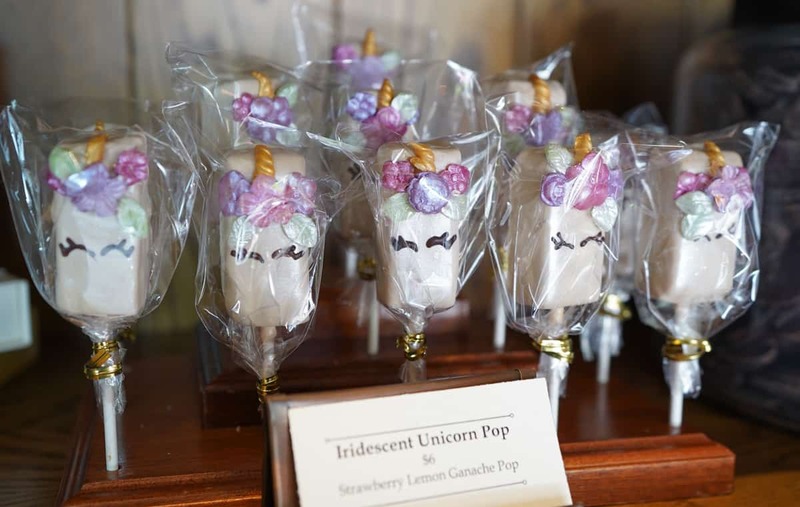 Their case is filled with adorable character inspired treats like cake pops and cupcakes, and candied apples. 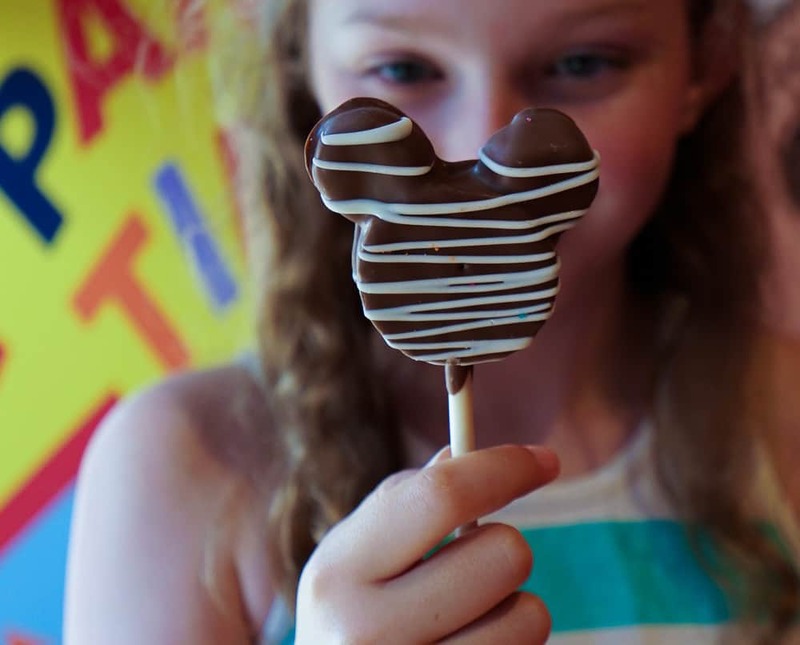 Giant Mickey and Minnie Rice Krispie treats bigger than a human head and chocolate dipped strawberries were great for those with gluten allergies. Goofy’s Candy Company has an array of fun cake pops. For our family, eating the vegan, gluten-free baked goods from Erin McKenna’s Baby Cakes was a ritual on past Disney World trips. The stand alone Erin McKenna’s Bakery NYC in the Landing section of Disney Springs offers the same great donuts, dessert breads, and cupcakes. The bakery uses no refined sugar either, so if your family has allergies or an aversion to processed foods, this is a great outing for a treat. I watched my gluten-free husband grin and gobble two cookies while still ordering more. We just ordered the gluten free and vegan birthday cake and had it delivered to the Grand Floridian for my son’s birthday, and we all devoured the six inch cake. It was delicious and would appeal to those without any dietary restrictions, too. We always grab “healthy” donuts at Erin McKenna’s Bakery. The Italiam tradition gelato place was what I was most excited to try. Granted, we have access to some of the best gelato in Boston (Morgan Morano, I am talking about you! ), so after trying several flavors at Vivoli, I kept looking for real flavor, and never found one. that felt worth the caloric splurge. The texture was creamy, but the flavors were bland. Morgan Morano has ruined Boston with her bold flavors and small batch process she learned from her Sicilian mentor. Our last stop was the Lego store to enjoy their Lego sculptures around the store’s interior and exterior. As we walked back to the finally finished parking garage, we stopped to gawk at the incredible Spanish-gyspy style guitarist Nicholas Marks, who uses his own guitar to create a separate rhythm accompaniment with lightning fast hands. He made every other musician performing that night seem like the reject acts. 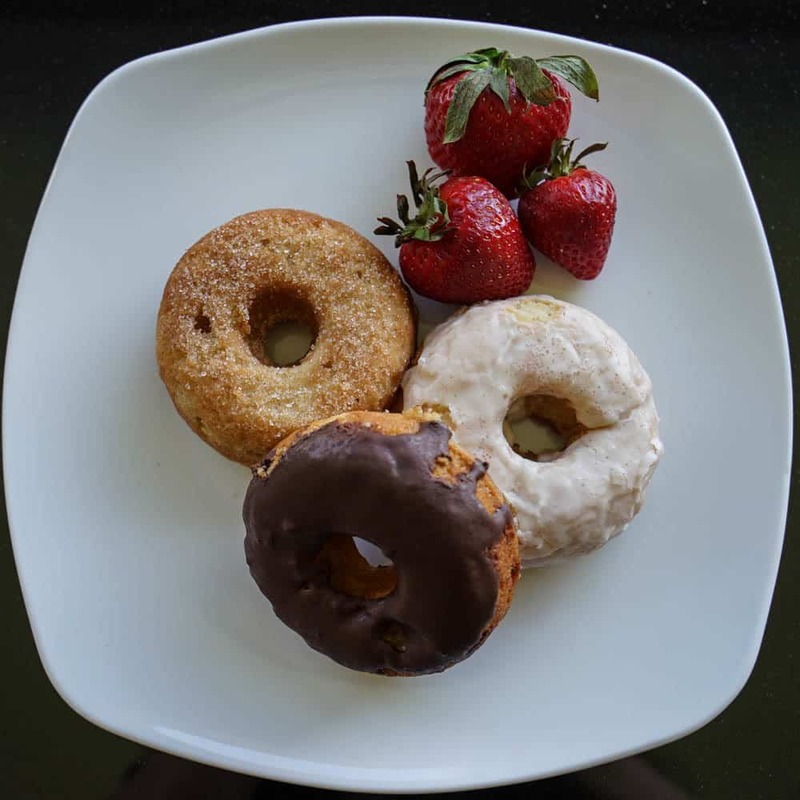 When his performance left us with our jaws dropping, we found our recently purchased vegan donuts fit perfectly into our mouths. 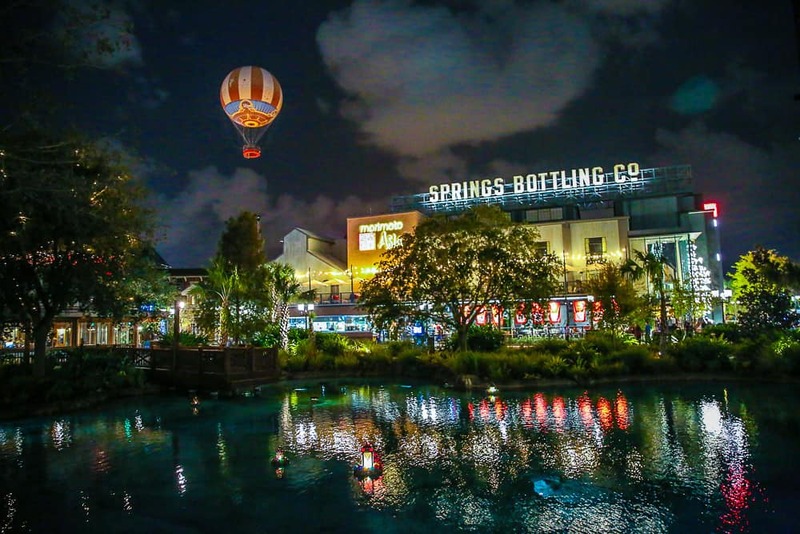 If you have never been to Disney Springs before, it might be worth checking out once if 1) you live in a community without these kinds of commercial places to walk around 2) you are passionate Disney fans who like to buy Disney merchandise in the Marketplace, the resort’s largest Disney store, or 3) you want to drink without the kids. But there are other places within the Walt Disney Resort we would personally rather spend an evening with our kids, especially during a shorter trip, that are far more specific to Disney World: a walk around the grounds of the Art of Animation Resort to take photos of the incredible sculptures, visit the Boardwalk, hear the fabulous ragtime band in the Grand Floridian lobby, or watch the fireworks from the Polynesian Resort beach. 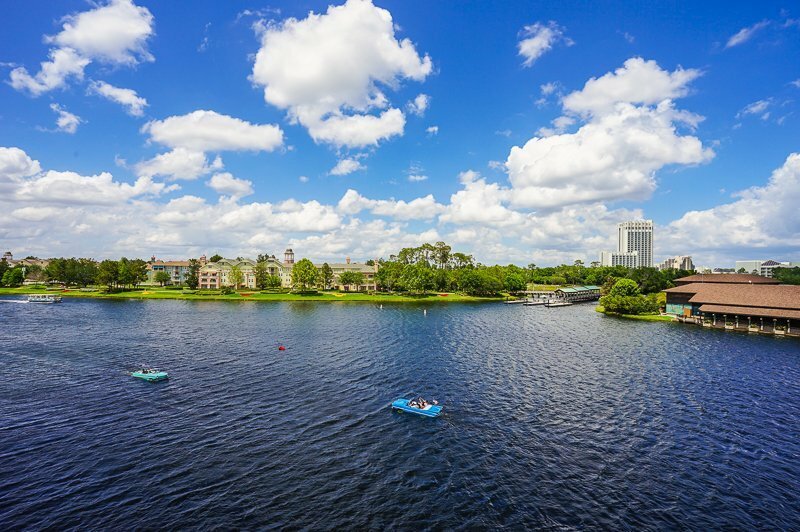 If you are planning on making a trip to the area and want to make Disney Springs the focus of an adult-only trip, I strongly suggest the B Resort (Check out our photo feature), which is an official Disney Springs hotel that is a generous walk away. Although it offers plenty of family amenities, its sleek design and spa make it a perfect adult getaway, too. The patio view from Frontera Cocina, the new Rick Bayless restaurant at Disney Springs. 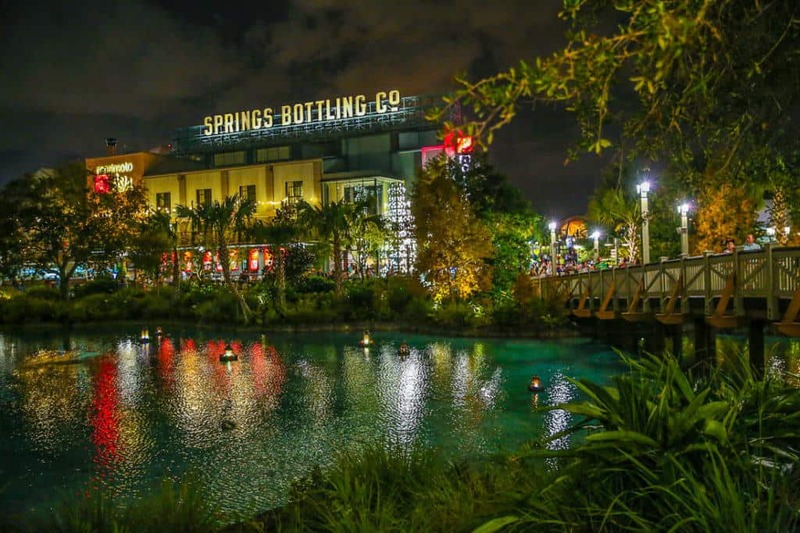 I had a wonderful time exploring the new restaurants and offerings of Disney Springs with my family. I’ll keep updating this article with each new restaurant, because there are too many places to try in a week! Even Splitsville Orlando has food beyond your standard bowling alley fare. As always on any vacation, certain experiences don’t live up to the expectations while other meals were outstanding. I’m just glad we don’t have food allergies in our family with more serious consequences. And I really did enjoy being in the space. CA needs to kick it up a notch it sounds like! Denise, Thank you so much for this. I apologize to readers. I learned very humbly this morning that I am unable to post an article with a fever without a big editorial cost. Such a bummer that it wasn’t a more pleasant experience–definitely could have fooled me based on the decor and ambiance like you said! And I’m really surprised to hear your comments on the waiter–seems so “UN-Disney”. Glad some of the other treats–chocolate & baked goods–made up for it. Our favorite Disney restaurant is the Blue Bayou–not super fancy, but fancy enough to make for a nice lunch or dinner. People totally go to Disney World for the food! I do, at least. It’s one of the things I like best about Disney World – deciding where to eat, especially at EPCOT! It’s too bad about gluten-free request – Disney usually goes above and beyond to honor any special dietary requirements. I am gluten-free as well and always feel safe eating at a Disney restaurant. I agree Colleen that Disney had always earned great points with us for their care in special diets. This issue cost us a full vacation day, and others should be cautious until this new kitchen gets things running better. And I do agree about Epcot! The restaurant certainly looks beautiful. Too bad that the food quality and service do not match the decor! The chocolates look delicious and tasty though. A small consolation. Robin, thanks for the really honest review. It goes to show, just because a restaurant looks nice, it doesn’t mean that the food is going to be as good. I’m hope that the bad meal didn’t ruin your holiday, however and the chocolates do look delicious! Fortunately, the meal only ruined my dinner. : ) But I can’t say the same thing for my gluten-intolerant loved one. 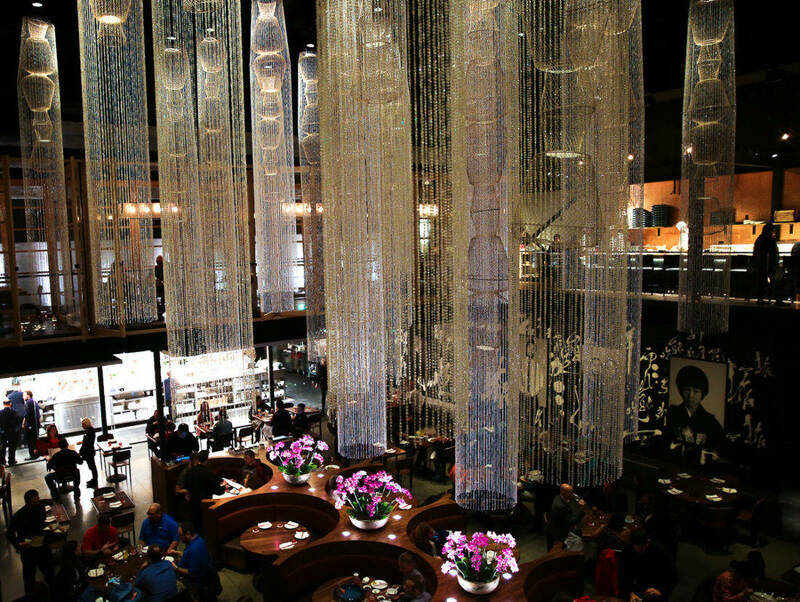 The space is so gorgeous, and it is still a great place to grab a drink or simple sushi, so all is not lost! I’d like the try them all! Especially the Morimoto Asia Disney Springs. The decor is great and the food looks fabulous. I had no idea there was a Rick Bayless resto here! Being Canadian, we don’t have any of his restaurants, but I’m a huge fan and would make a trip here especially! 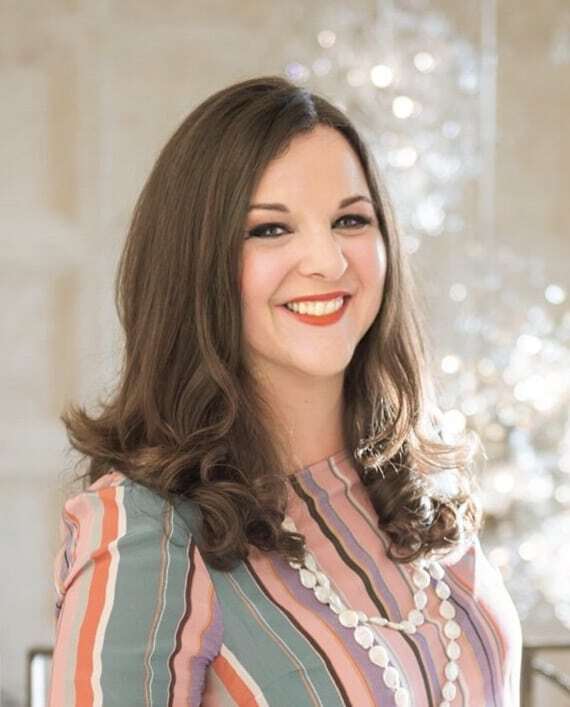 I’m a Foodie can’t wait for more news on brand new hotels! !